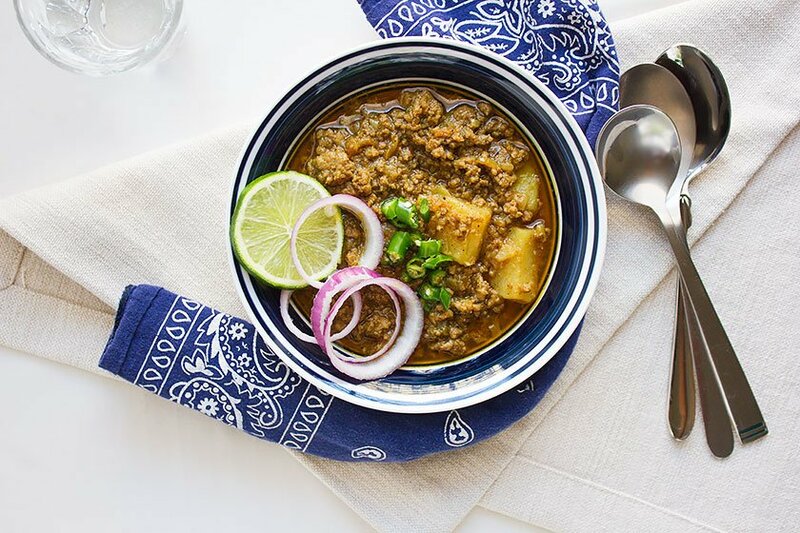 I won’t write about my love and craze for India, since I’ve done so in many of my previous posts, but will tell you about a small secret, the secret is not in this Aloo Keema recipe, but where to get the most amazing and flavorful food in India. If you think that five-star hotels and restaurants serve the best food, then let me tell you that you are wrong. The best tasting food is found in small, humble restaurants, and in Dhabas. A Dhaba is a restaurant located on the side road, mainly on highways. Making Aloo Keema Dhaba Style. When you travel within Indian by Bus or Car, you will come across many of the Dhabas. In a dhaba, local food is served and 90% of the time that food taste out of this world. Keep in mind that food at a Dhaba won’t be (how shall I say this?) the healthiest if I may say so. 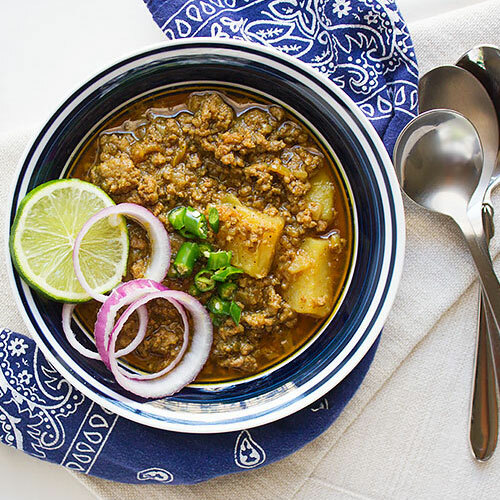 They use Ghee, whole cream milk, and lots of spices, which make their food oh so good! 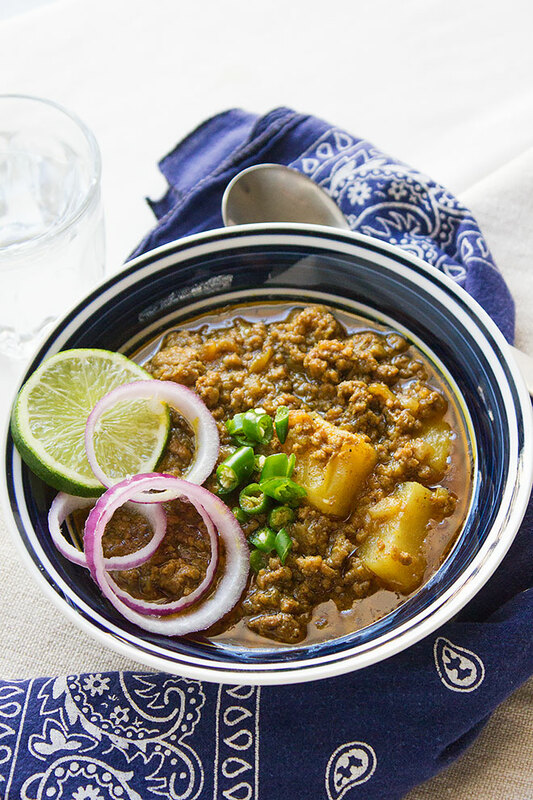 In this post, I’m sharing with you a Dhaba style Aloo Keema (Minced mutton with potato.) Forgive me, I’m not going to modify any part in this recipe. Either you go 100% Dhaba style or you go home. This is the real deal and there is no shame about it. 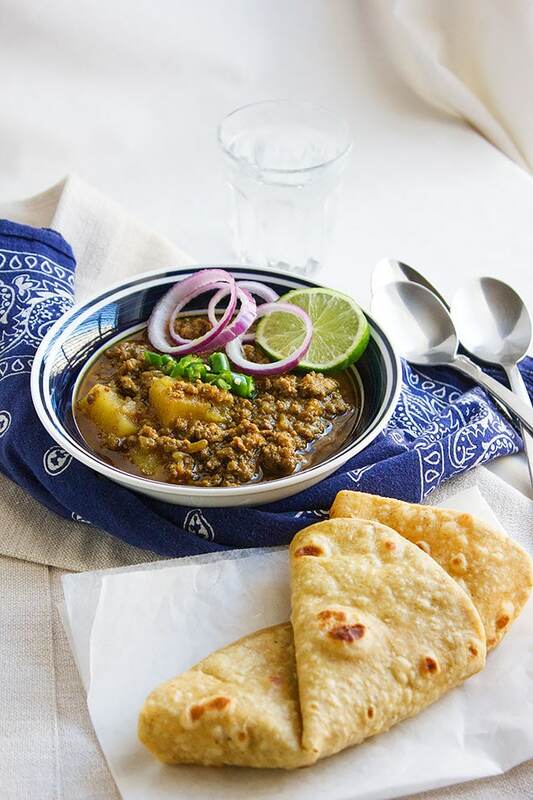 Tender minced mutton in a thick spicy gravy, perfectly seasoned and its great companion is Indian bread. If you want to have the flavor of spices in your cooking especially from ginger and garlic, then it’s best to use a mortar and pestle. 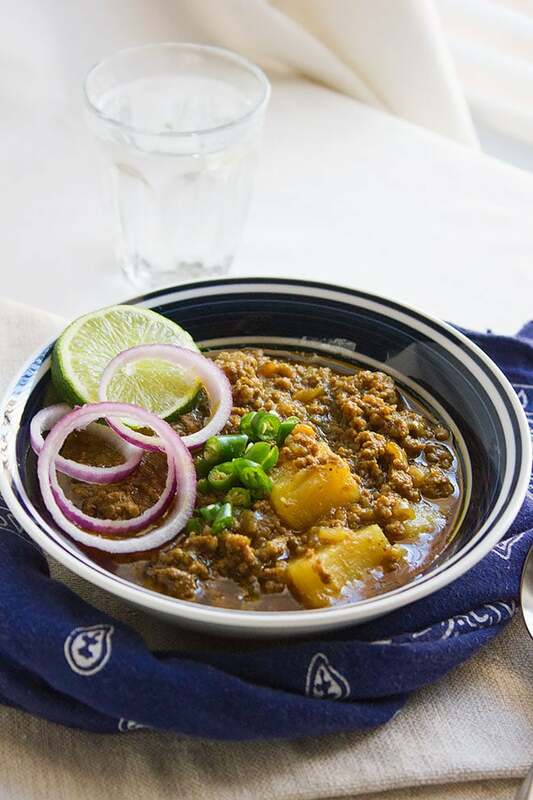 Pounding the garlic, ginger, and green chili brings out the oil and juices which contribute to the great flavor. 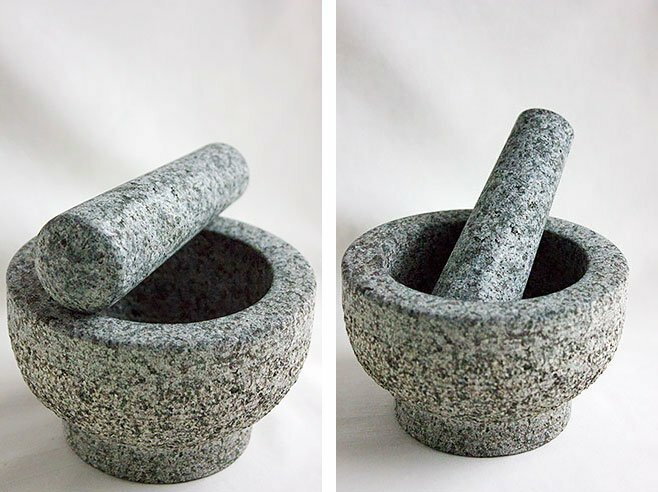 I have used IMMORTAR’s mortar and pestle. They sell a high-quality product that looks good and long lasting. The product is made of PREMIUM GRANITE and has a LIFETIME GUARANTY. 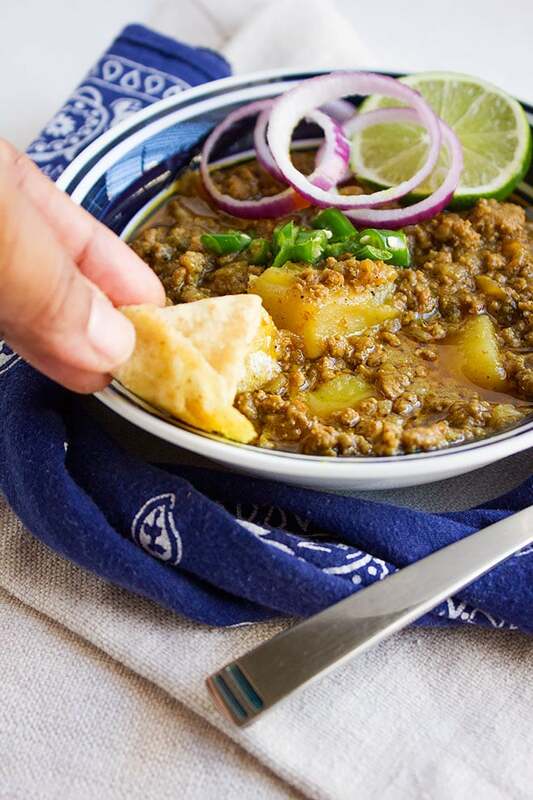 I will teach you how to cook Aloo Keema in a pan and how to cook it in a pressure cooker. 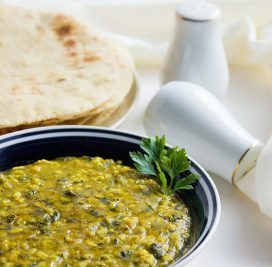 In a pan, add the ghee and when hot add the chopped onion. Cook until light brown. Add the ginger and garlic to the onion and stir for few seconds on medium high heat. Add the chopped tomato and cook until the ghee comes to the surface, now add all the spices, green coriander, and green chili. Stir for two minutes on medium heat. Add the minced meat and stir occasionally for 10 minutes on medium-high. Add the potato and stir for two minutes. Add enough water to cover the keema, cover and let it simmer on medium-low heat for 20 to 25 minutes. Stir occasionally to avoid burning the food. After step #4, pour enough water to cover the keema, cover with pressure cooker the lid. Keep the flame on high and wait for two whistles then turn off the heat. Do not open the lid until all the pressure is released. This post may have some affiliate links! This post is sponsored by IMMORTAR but the opinion is all mine! Loads of flavours and I love the fact that you can prepare this in pressure cooker…really neat! Wow! 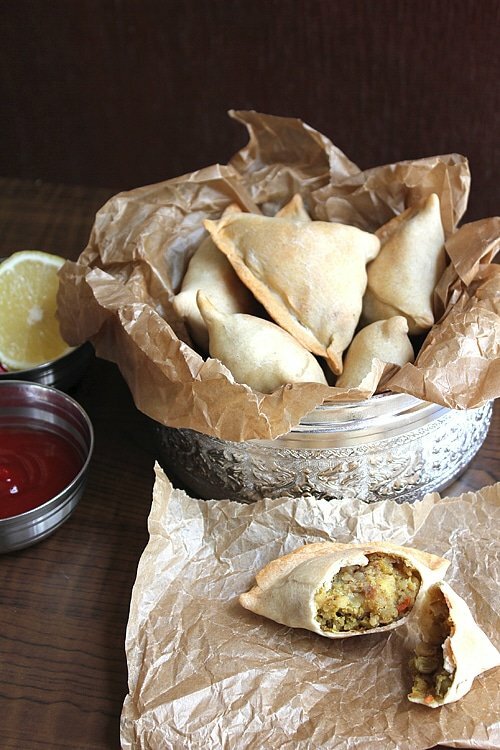 This recipe looks like spice heaven. Makes me think of my friend, Sumita, who made the best Indian food ever. Then I had to go and move 500 miles from her. Time for a visit since you made my mouth water for Indian food! Oh wow! This looks delicious and I bet the flavors go together amazingly! yum! Looks like something I would love to try! This sounds so yum and somehow I have all of these spices on hand. Pinning for later! Hope you enjoy making and having it as much as I did! Sounds very delicious! So many yummy spices too! It was a great tasting and filling dish indeed!